Fairfax High School baseball star Mike Epstein played all or part of eight Major League seasons with Baltimore, Washington, Oakland, Texas and the California Angels, from 1966 to 1973. After signing with the Orioles, Epstein was the California League’s (Class A) 1965 Rookie of the Year and Most Valuable Player. In 1966, he was named the International League (Triple A) Rookie of the Year and MVP, as well as picked by The Sporting News as its Minor League Player of the Year. 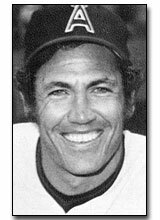 Epstein was baseball’s first “designated hitter” in 1973, and the bat he used that day is enshrined in Baseball’s Hall of Fame in Cooperstown, NY. During his career, he tied the Major League record for most home runs in consecutive appearances (4) in 1969, and hit three home runs in another game during the same season. In 1967, Epstein established an American League record for most putouts (32) and chances (34) by a first baseman in an extra-inning game. And, he led American League first basemen in double plays with 123 in 1971. Mike’s career stats include 130 home runs, 380 RBIs, and .244 Major League batting average.